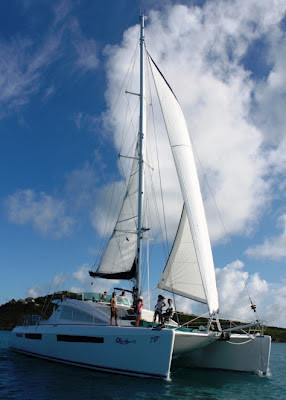 Due to last minute availability between July 2 - 21, 2012 - we are offering luxury catamaran JERI with a 10% reduction in Summer rates for a charter in the Grenadines, Leeward Islands or BVI/USVI! **** Also available in the BVI/USVI, Leewards or Grenadines from the 18th August 2012 to September! Welcome to a world of Style & Elegance.... Designed for comfort, performance and safety, this Privilege 615 luxury catamaran introduces her guests to a world of exception. JERI offers her guests 3 luxurious guest cabins and 1 exquisite owners suite. The Master or owners suite is located forward Portside and features a walk around king size bed (approx. 7ft 8 inch x 7ft), in room computer. The VIP located aft Portside features a king size bed (approx. 7ft 8 inch x 7ft). Located on the Starboard side aft is a third guests cabin featuring a queen size bed (approx. 7ft 8 inch x 6.3ft). This bed can be converted into twins. The fourth guest cabin which features the smallest square footage located on the starboard side forward features a queen size bed (approx. 7ft 8 inch x 5.8ft - two single mattresses). Experience one of the Caribbeans finest catamarans!